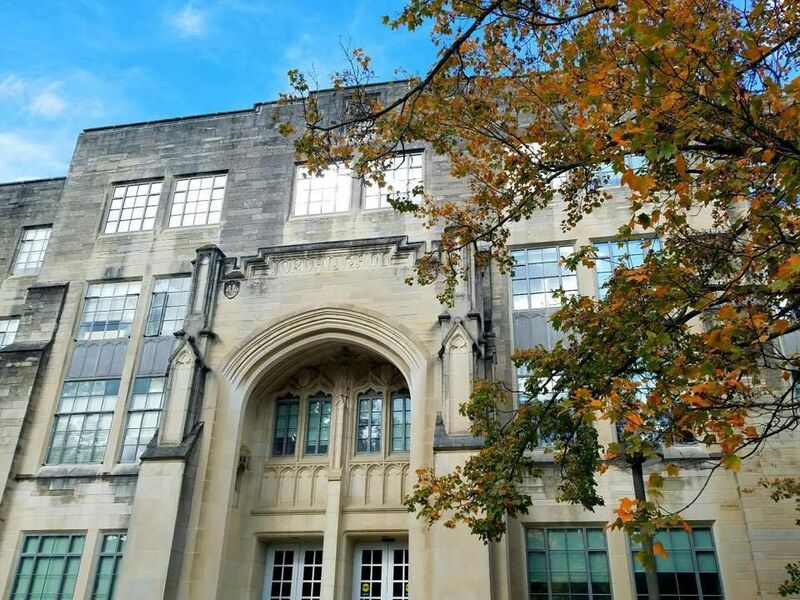 On Monday, an unidentified person or group of people plastered the walls of Ballantine Hall with notes urging Indiana University to rename Jordan Hall. Jordan Hall, the building that houses the biology department, is named after David Starr Jordan, a known eugenicist and past president of IU. 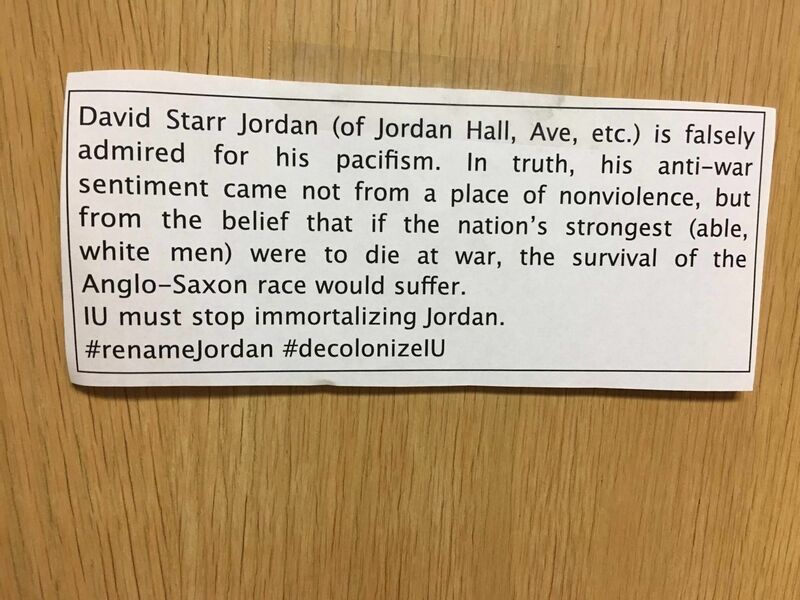 The notes found in Ballantine Hall call for the University to stop memorializing eugenicists, using the hashtags "#RenameJordan" and "#decolonizeIU." 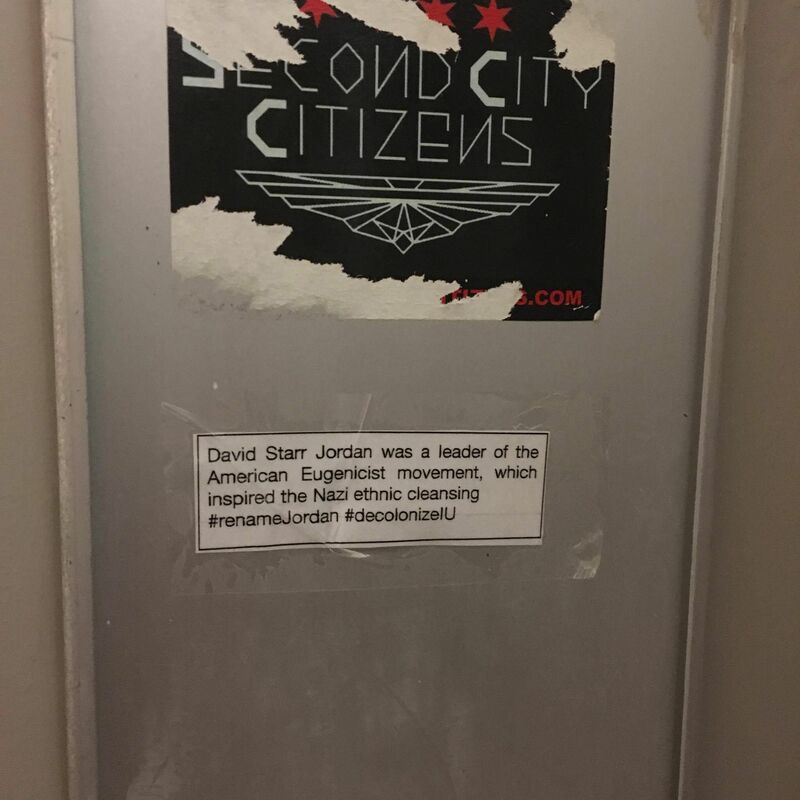 "David Starr Jordan was a leader of the American Eugenicist Movement, which inspired the Nazi ethnic cleansing," a note in Ballantine Hall read. Strangely, this isn't an isolated incident. On Tuesday, Professor Scott Michaels, the Associate Chair for Research in the Department of Biology, sent out an email to his colleagues alerting them that "several dozen notes were posted around Jordan Hall describing Jordan's activities/writings," and urged them to remove the notes. According to Scott, someone broke in to Jordan Hall's labs and flyered the notes in the labs. "Annonymous notes were posted on walls, inside display cases, over top of research posters, and most problematically, inside research labs," Michaels said. He said he is most concerned with the break in to the labs becuase they use hazardous materials and prior to this, Jordan Hall has suffered a "long string of thefts." 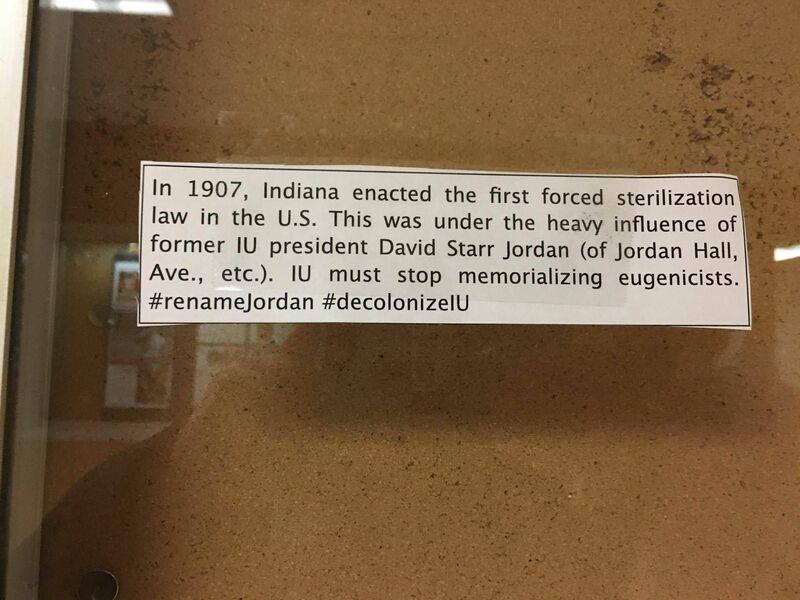 "1906: David Starr Jordan chaired the first U.S. eugenics organization, a chapter in the American Breeders Association #renameJordan #decolonizeIU"
"In 1907, Indiana enacted the first forced sterilization law in the U.S. This was under the heavy influence of former IU president David Starr Jordan (of Jordan Hall, Ave,. etc.) IU must stop memorializing eugenicists. #renameJordan #decolonizeIU"
"David Starr Jordan's achievements: 1902: published one of the first books dedicated to eugenics. 1905: implicated in the coverup of a woman's murder. 1906: chaired the first U.S. eugenics organization. 1907: helped pass the first forced-sterilization law in Indiana. 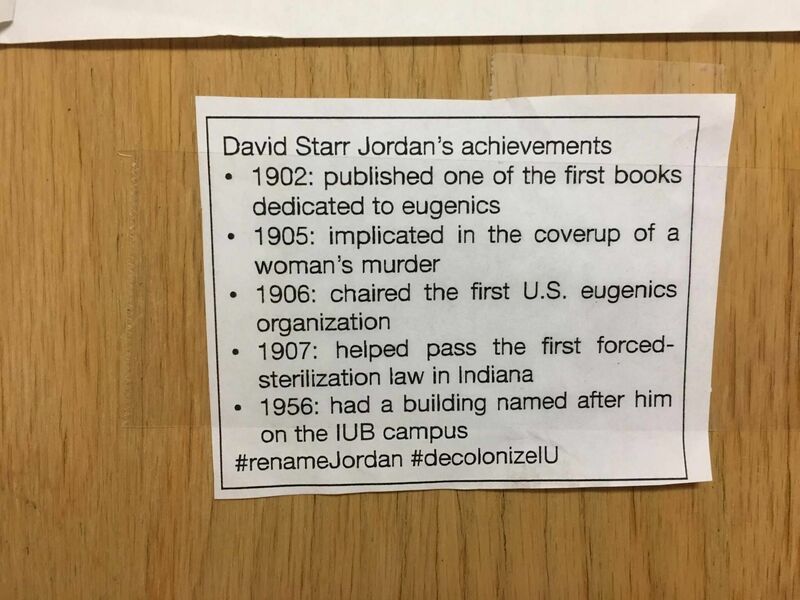 1956: had a building named after him on the IUB campus #renameJordan #decolonizeIU"
"David Starr Jordan (of Jordan Hall, Ave, etc.) is fasely admired for his pacifism. In truth, his anti-war sentiment came from not a place of nonviolence, but from the belief that if the nation's strongest (able, white men) were to die at war, the survival of the Anglo-Saxon race would suffer. IU must stop immortalizing Jordan. #renameJordan #decolonizeIU"
IU Junior Lydia Riley was on her way to a club meeting when she found the notes in Ballantine Hall. "I was confused and a little shocked, but not that surprised considering IU has supported some shady people in the past," Riley said. By "shady people," Riley means when the Media School hosted Charles Murray when he spoke in Franklin Hall last semester. But is removing the legacy of a dead eugenicist grounds to rename Jordan Hall? After reading Jordan's Wikipedia page, Riley said she knows the ex-IU president did a lot of "bad stuff," but logistically it would be difficult to remove his name from Jordan Hall as it's carved into the building. "Morally, it's the right thing to do," she decided. As for Professor Michaels, well, he's on the fence about changing the name. "Many universities, and indeed even the entire country (e.g., Confederate statues), are struggling with how to deal with the legacy of important, but imperfect, people," Michaels said. "I don't think anyone has the correct answer yet."